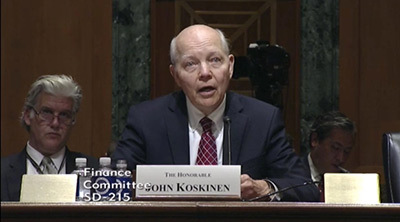 Whatever IRS official Lois Lerner may have done in regard to targeting conservative groups for extra scrutiny in the 2012 election cycle, she did set one example that Internal Revenue Service Commissioner John Koskinen hopes to emulate. The House Judiciary Committee plans to hold its second hearing in a month on Wednesday in an effort to impeach Koskinen. Republicans say Koskinen made false statements to the U.S. Congress during its investigation of the IRS targeting scandal. Koskinen responded that the charges "lack merit." He has also said he plans to serve out his full term, which ends in November 2017. Last week the House Oversight and Government Reform Committee voted along party lines on a resolution that censured Koskinen and called for him to forfeit his government pension. But as with Lois Lerner before him, the power of Congress to strip Koskinen of any benefits is limited. It would require that both houses vote to impeach, with a two-thirds margin in the Senate – not likely with no support from Democrats. So Koskinen will likely retire with all of his benefits intact, although with fewer years of government service, he won't get the kind of money she's getting. And even though Koskinen has gotten pulled into the scandal, he wasn't appointed until late 2013, when the damage had been done. It's impossible to say how culpable Lois Lerner is in the IRS targeting scandal. We only know for sure that she was in charge of the division responsible. At the very least, Lerner was aware of what was going on. She actually broke the news herself at an American Bar Association meeting in May 2013. Lerner admitted the IRS specifically searched for groups with "names like Tea Party or Patriots," and that those groups were asked questions that were "far too broad." "That was wrong, that was absolutely incorrect, insensitive, and inappropriate — that's not how we go about selecting cases for further review," Lerner said. That was much more than she would say at a House Oversight Committee hearing two weeks later. Instead, Lerner invoked her Fifth Amendment right not to testify. When she returned to her IRS office that day, Lerner was told she had been placed on "indefinite administrative leave" and needed to clean out her desk. In September 2013, three weeks before her 63rd birthday, she officially retired from the IRS. Because no wrongdoing on her part was ever proven, Lerner was eligible for her extremely generous retirement benefits. Although we don't know exactly what Lerner received, her benefits were based on her length of service as well as her high-ranking position. The Wall Street Journal reported her salary at the time of her retirement as $177,000, a salary she continued to receive during her four months of administrative leave in 2013. In addition to her salary, Lerner received an average of $43,000 a year in retention bonuses from 2010 to 2013. Based on what is known, the National Taxpayers Union estimated Lerner's annual pension at $102,000, nearly twice the annual U.S. median household income. In a September 2014 interview with Politico, Lerner put her annual pension at $100,000. Should Lerner live to age 87, the average lifespan of a female in the United States, the National Taxpayers Union estimates she will collect a total of $3.96 million in pension payments. No doubt she and her husband, attorney Michael R. Miles, need the money to keep up the payments on their suburban Washington home in Bethesda, Md. The 6,500-square-foot home, replete with eight bathrooms and a pool, sits on 0.63 of an acre and has an estimated value of $2.57 million (see photo, taken from Google Street View). These days, Lerner spends much of her time walking her dogs, gardening, and volunteering at a local arts nonprofit. Last October, the Department of Justice closed its two-year investigation into the IRS targeting of conservative groups, determining that no charges were warranted against Lerner or anyone else at the agency. Knowing how the Lois Lerner story turned out, it's a safe bet John Koskinen isn't losing any sleep over these impeachment hearings. It would be too nice to describe Koskinen as an Atomic Weasel. Wow is this guy a professional liar !